Click HERE for a FREE TRIAL MONTH! Check out these Incredible Features! Reach 1000's of Potential Customers! 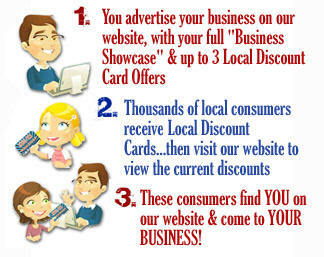 Our "Local Discount Card" will Drive Customers to YOU! 3) Finally...to get them to shop & spend money at YOUR BUSINESS! We are distributing 1000's of these cards through local non-profit groups. Customers come to our website to find out what discounts they are entitled to....and that's where they find YOU! 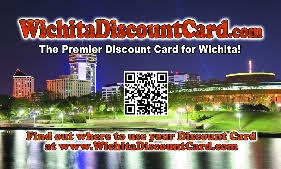 When you sign up with The Wichita Discount Card, our team will work with you to customize your Business Showcase page. In addition to the Wichita Discount Card coupon, you can also upgrade your program to include mobile coupons, promote your business on our VIP Club, let us create your own VIP club, or promote your business through our e-mail campaign options. When you advertise with us, you get the most innovative & interactive advertising in town! 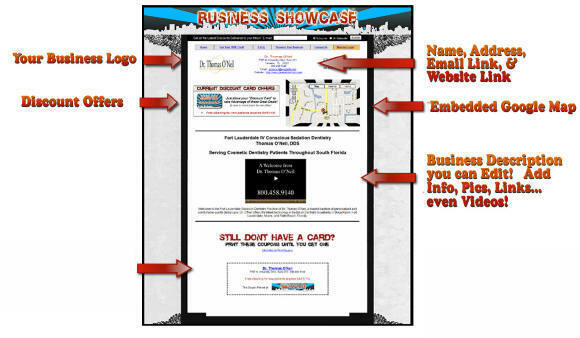 Your "Business Showcase" page is a full web page containing your current discounts, but also so much more!